In another news of man’s fascination with the red planet, a fresh set of released photos taken by NASA’s Mars Reconnaissance Orbiter in Martian orbit shows a crater created due to European Space Agency’s (ESA) Schiaparelli lander’s land on the surface of Mars. 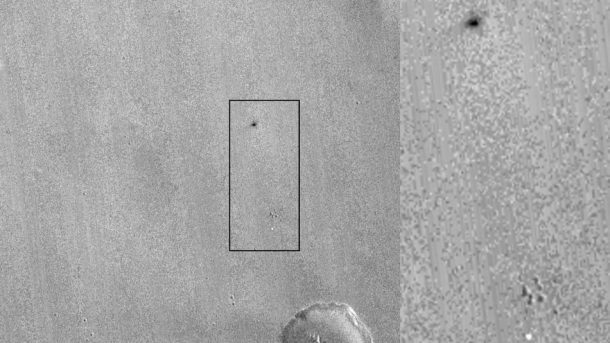 A dark spot was captured at the place where the Schiaparelli was expected to land accompanied with a lighter spot which could be the spacecraft’s parachute. An explosion of the lander is also being dreaded by the ESA, and it is a possibility since its tanks were full of fuel after its thrusters cut off prematurely. However, this speculation is unconfirmed and the scientists need more information before passing a judgement on the fate of the lander. But despite all the speculation, Mars Reconnaissance Orbiter is expected to fill this information gap with its high-resolution photography next week. 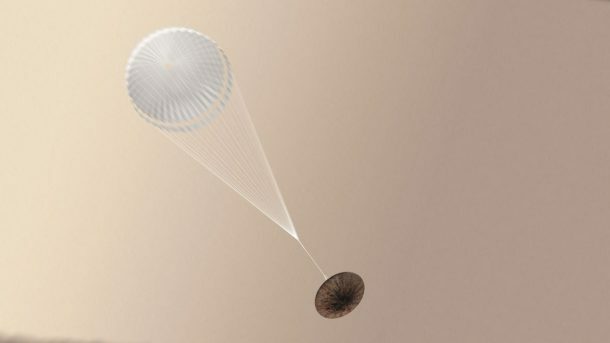 ESA mission was to commit the landing as smoothly as possible, but just 50 seconds before the touchdown, ESA lost contact with the lander and failed to deploy the thrusters that would have fired to slow its landing, along with spacecraft’s parachute and heat shield. The Schiaparelli was created and sent with the collaboration of Russia and while dozens of missions have been sent to the red planet, only seven of NASA’s mission have ever been successful. But although it seems Schiaparelli has failed, in essence, it’s mere landing is also a great success. Thanks to Schiaparelli, the ESA has valuable experience and data on how to land a spacecraft on Mars and eventually humans when they are finally going there to colonise the planet.